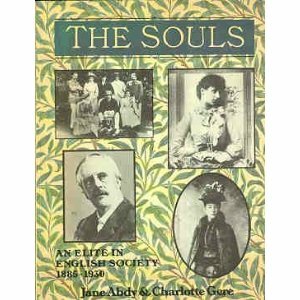 The 1980s were apparently a last hurrah for books about Edwardian society (no doubt in reaction to the death of the last Edwardian and “Soul”, Lady Diana Cooper, who died in 1986 aged 93), and the year 1984 in particular witnessed the release of two books about The Souls. I discussed a little about this group a few years ago, having only a passing familiarity with its origins and members via Anita Leslie’s The Marlborough House Set. Now that I know more about them, I can see why Leslie only allotted a smidgeon of space to their doings: they were the antithesis of the raucous and pleasure-loving social set surrounding the Prince of Wales. Yes, The Souls had their love affairs, house parties, and balls, and they were also of the ruling elite; but intelligence, wit, beauty, literature and art were their primary focus. Most eschewed the incredible eating habits of the Marlborough House Set, they mostly disdained sport, and the women avoided the fussy fashions of the day. However, the most important aspect which separated The Souls from the Prince of Wales’s set was that its leaders were the women. The men of the group revolved around such luminaries as Ettie Desborough, Lady Elcho, Margot Tennant, Violet, Duchess of Rutland, and Madeline Wyndham, and their brains and talents were valued just as much as their beauty. For a breezy and general overview of The Souls, the Abdy & Gere title is best. From what information I could find online, this was a companion book to an exhibition hosted in 1982 at the Bury Street Gallery. As such, The Souls places greater emphasis on defining the group and their influence on art, politics and society of the 1880s and 1890s. The book is neatly organized into chapters devoted to the more important members, with asides to “The Indispensible Bachelors,” “The Fringes of the Circle,” and “Americans in the Souls’ Circle.” The Souls is amply illustrated with portraits, sketches, and paintings by some of its members of one another, which, while very beautiful and helpful for identification (Violet Rutland was a superb artist), reveals the book’s limitations as a thorough biography. This is where the Lambert book comes into play. One element I find most illuminating are the subtitles given to the American release (A social history of the illustrious, irreverent, intimate group of British aristocrats known as “the Souls”) and the British release (The Indian Summer of the British Aristocracy, 1880-1918)–the latter is more serious, no? Nevertheless, the contents of both editions are the same, and the frivolous subtitle given to the American edition does not do this book justice. Lambert accessed diaries, letters, and newspapers of the day, and interviewed the children, grandchildren, and friends of The Souls to paint an honest and thorough portrait of this unique clique of friends and lovers, and it shows. She frames their story in both the context of the late Victorian and Edwardian eras, and in their personalities, exposing the hypocrisies of the people and the age, but also why the Souls were so astounding to their contemporaries. 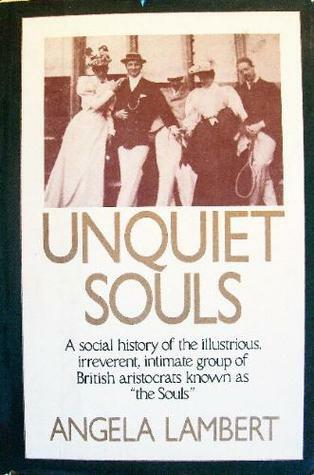 Of course the long-buried scandals and secrets come to light in Lambert’s book (the most surprising being the unmarried Margot Tennant’s decision to lose her virginity to Wilfred Scawen Blunt at age 28), but the book’s high point is when the scene shifts to the “Corrupt Coterie”–the Souls’ children and their friends–and the hell that was WWI. It is chilling to read excerpts of the letters written by Raymond Asquith and Julian Grenfell to their parents, who were influential enough to tear through the intense pro-war propaganda churned out by the government. Moreover, the tight focus on The Souls and The Coterie brings WWI to life when a list of the entire group shows that save for Duff Cooper and Oliver Lyttelton, the sons of the Souls all perished on the battlefield. More so than any other book I own in my research library, Lambert’s Uniquiet Souls gives one of the best portraits of the Edwardian era, and though there are brief passages of repetition, this is a must-have for anyone desiring to build a solid foundation in this time period. The Abdy & Gere book is also a very worthy companion, and its focus on the art and literature of the Souls is superb and entertaining. Both books sound incredibly interesting. I’ll have to see if my library has them. They sound very intriguing indeed. Thanks for sharing. Dear Evangeline, I have just been to Amazon’s website. These books are already collectors items, “The Souls” is very expensive, and Angela Lambert’s book may be had in second-hand copies. Both books sound very interesting and revealing. Thank you for the post, I enjoy learning more and more each time! I also use AbeBooks for my second-hand book purchases. Since the Lambert book is published under two titles, search for both to find a more inexpensive copy. And you are very welcome; thank you for enjoying the blog! Fascinating post! I have long loved “The Souls,” and have two copies of Lambert’s book. While in England, I visited Stanway House, the estate of Lady Elcho where they often weekended. Now I’ll look for Abdy and Gere’s book. Thank you!